I started a GO FUND ME PAGE where I am raising $2000 which includes taxes and fees and other charges to make Love 2 Love Ya products to help raise funds for my small boutique business. I would like to take it up another level. I'm looking to create products such as bags, tee shirts, and other items with my logo on it as a fundraiser to help my business. I need your help getting the products made. It is my Love 2 Love Ya line which is my Christian Women's Ministry Outreach. I write about Biblical Marriage, Struggles being a Christian, Why being Christian is SO AWESOME, and other words of encouragement. I would like to get this off the ground by Nov. 1, 2013 so I can have products ready for Christmas and Valentines Day. Love 2 Love Ya is all about loving you as God made you, loving others as God loves you, and Loving God because HE first made you! Help me reach and encourage other women by supporting this mission! I would take $1 amounts but it says it has to start at $5. 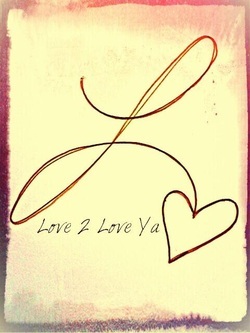 I love 2 love ya!